What's The Deal With Illinois' Traffic Death Highway Signs? The emergency information signs are installed around Illinois and among their messages in rotation is one displaying the provisional number of traffic fatalities in the state. The above number is not current. 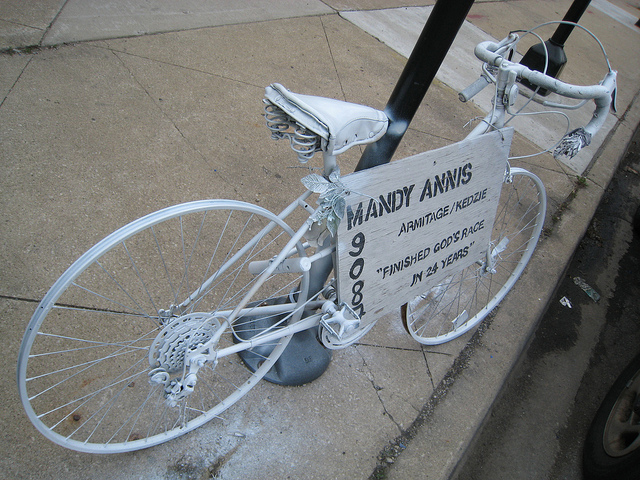 Ghost bikes around Chicago commemorate cyclists who have been killed in motor vehicle accidents. 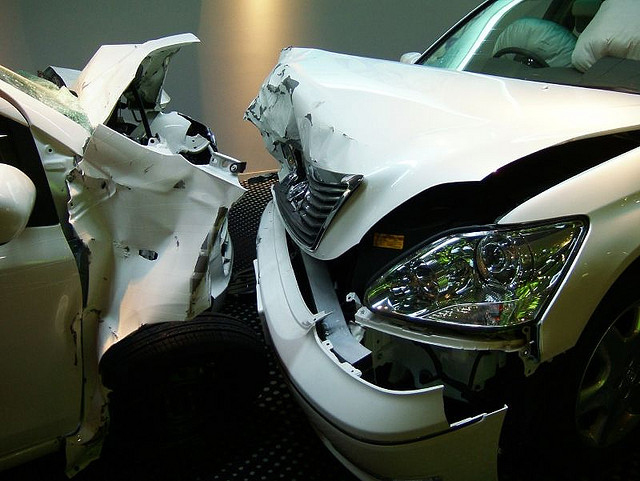 When weather starts to warm up, more motorists are out and more accidents and fatalities occur. What is the deal with the traffic related death toll rate tally signs on expressways? 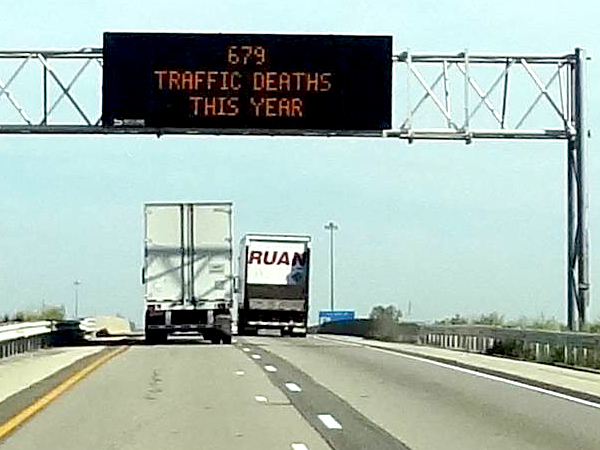 The very short answer is these signs display the current number of confirmed deaths in the state of Illinois that involved a motor vehicle (car, truck, motorcycle, bus, etc.). This could mean a fatal crash involving a car and a bicyclist, a pedestrian killed in a motorcycle collision, a car hitting a tree, you get the idea. The numbers of confirmed deaths are collected and processed by the Illinois Department of Transportation as part of a federal mandate. John Webber is the Interim Director for the Division of Traffic Safety for IDOT. He says the number of deaths displayed on highways is provisional and gets updated every day, Monday through Friday and disseminated to highway offices around the state. Those offices then switch their highways signs over to reflect the new number. The idea that these numbers are provisional deserves more explanation. A death that involves a motor vehicle can also involve other factors that would mean it doesn’t get added to the count. Webber says sometimes drivers are suffering from an illness or impairment that may cause a crash. “Let’s just say I’m driving down the street and I have a heart attack and I veer off the road and hit a tree and I die. Well the coroner will determine if I died of the heart attack or if I died from the crash,” Webber says. If the coroner rules the death was due to the heart attack, it would not be added to the traffic death toll. Webber adds that sometimes a person may end up dying of injuries from a crash that occurred a month earlier, and that report may take some time to be filed with his offices. Another factor that makes real-time reporting of traffic deaths impossible is that some of Illinois’ police stations are still filing traffic incidents reports via paper, rather than electronically submitting them. At the time of writing this story, Webber says the fatalities from 2012 are still being calculated. Early in 2012, IDOT spotted a disturbing trend: there was an alarming uptick in fatalities from year’s past. By May 2012, Webber says there were 65 more crash fatalities than in May 2011. Why that was can’t be known for sure, but he guesses the unseasonably mild winter had a lot to do with it. The logic goes: the better the weather, the more motorists and the higher the probability for crashes and fatalities. IDOT and a number of other parties including the Illinois State Police and Department of Public Health came together for a safety summit to figure out how they could help tackle the problem. Webber says of the many ideas they discussed, one that had unanimous support was one that also had no cost: to use the electronic emergency highway signs to alert people about traffic fatalities. He says these signs were installed in the early 2000s all over Illinois (as budget allowed), and their primary purpose was and still is to notify motorists of emergencies. Messaging on them ranges from AMBER alerts (child-abduction notices) to traffic times to the classic seat belt safety slogan “Click It or Ticket,” among others. In July of 2012, they added the traffic fatalities message to the rotation. IDOT also expanded the campaign to videos such as this, and other messaging as well, including front billing on their website. Webber says other states have used electronic signage to show similar messaging. Webber says he knew there’d be some controversy around posting traffic fatality numbers in this way. But he estimates that three out of four folks who contact IDOT about the signs are in support of them. But that 25% who are not tend to have a very personal reason why. When I asked Webber how they’re measuring the effect of the signs, he says he can only look at the numbers. From the time they began posting the fatalities count via the electronic signs last summer, there was a net decrease in fatalities. But whether or not the signs were to thank for it Webber says, is anyone’s guess. He points to a statistic norm: at the beginning of the “driving season” (unofficially, when the weather gets consistently nicer) there tends to be inordinately more crashes and fatalities, but that levels out as spring and summer turn to fall. So the new messaging on signs hasn&apos;t changed that oddity of human behavior, but Webber thinks they haven’t hurt either. He says IDOT has no plans to stop the messaging anytime soon. The statistics compiled from 1920-2011 show Illinois’ traffic fatalities on the whole have been hovering in the low 900’s the last couple of years, down from years past. Still, of course there’s no reason to celebrate. After all, these figures represent real people who have died, and untold numbers of friends and family who suffer. It’s a sobering reminder to stop texting, eating or otherwise drive distracted or impaired. Do the signs give you pause? Have they caused you to slow down? Let us know how you feel about them by commenting below. Comments received before 3 p.m. on Wednesday, April 10 may be used on air during The Afternoon Shift. Thanks goes out to all the curious people who asked a question about the traffic death signs: Juli Walter, Marah, Kate and Anonymous. Jennifer Brandel is the senior producer of Curious City. Follow her @JenniferBrandel and @WBEZCuriousCity.